Flies are a common problem in most areas. House flies, fruit flies, biting black flies, horse flies, and whiteflies are the most common fly pests for most homeowners. Not only are they an unsanitary nuisance, but flies carry diseases. For your health and mental satisfaction, we need to get rid of those flies quickly and efficiently. I am going to help you find the best strategy to get the job done. Part of getting rid of the flies is understanding its life cycle. Very simply, the adult fly lays eggs in the available moist organic matter. The eggs develop into larvae which feed on the organic matter. The larvae then move to a dry place to pupate. Three to four weeks later, the adult flies begin the process over again. To effectively get rid of flies, you need to break this cycle, preferably in several places. There are many ways to do this, and I’ve tried to be thorough here and show you all of the effective remedies as well as a few fun ones. 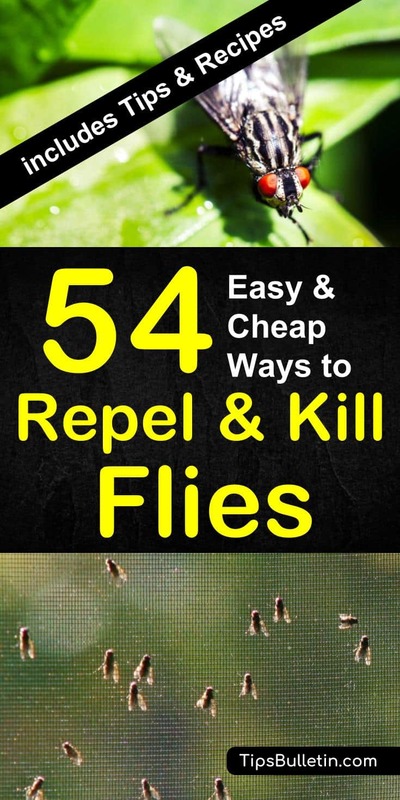 I hope these tips help you get rid of flies forever. What is the Best Way to Get Rid of Flies? UV light traps do an excellent job of luring in flies and other insects. Once inside the grid, flies are killed by an electric shock. These insect traps come in indoor and outdoor versions. For inside use, use a zapper designed for indoor use. Outdoor models allow the dead flies to drop to the ground. Flies don’t like citronella, camphor, or smoke. That’s why smoke is an effective way to keep flies away. Citronella smoke and camphor smoke are especially effective for discouraging flies. Light a citronella candle or a piece of camphor and place them in strategic areas to get rid of flies. This method seems a little suspect, but scientists report that it does work. Admittedly it is one of the most curious methods of how to keep flies away. Fill a plastic bag half-full of water and hang it in doorways, windows, and in areas where flies are a problem. The water reflects light in many different directions which interferes with the flies vision. Flies have compound eyes with approximately 8,000 lenses in each eye. This gives flies excellent vision in all directions at once. But stray light reflections caused by the bag of water can be confusing and cause problems with the flies vision. They leave the area to get relief. Outdoors, a fan can keep flies away from an area. Use a pole fan set to blow approximately 4 to 6 feet high, or elevate a box fan to this height. The air currents created will keep flies and mosquitoes away. Indoors, a fan can be used to keep flies away from a designated area, but they will relocate to another area of the house. Fruit flies and gnats are attracted to fermentation products and fruit products like wine and vinegar. You can make a simple homemade fruit fly trap using leftover wine or apple cider vinegar as bait. Leave a wine bottle on the counter with a small amount of wine in it. Flies will be able to easily enter the bottle but will have trouble finding their way out. Make a simple trap with a glass and a piece of paper. Pour a half-inch of vinegar into the glass. Form the paper into a cone that will fit into the glass above the vinegar. Tape the cone to hold the form. Cut the tip off of the cone to make a small hole large enough for a fly to fit through. Place the cone into the cup so that it rests above the vinegar. Tape it into place if necessary to hold it above the vinegar. Use any of the trap forms above with sugar water instead of vinegar or wine. The adage says that you can catch more flies with honey than with vinegar. And it is true for some flies. Which bait is best depends on the type of fly you are dealing with. Try both and see which works best for you. This trap is a very effective trap for those pesky fruit flies and has been used historically all over the world. Fruit flies are attracted to the milk solution and land on the surface. They are quickly suffocated and drown. You can vacuum flies with a regular vacuum, but they may fly out again when you turn the vacuum off. Special hand-held vacuums for catching flies have a trap door that prevents the fly from getting back out. A few minutes hunting flies with one of these vacuums every morning and night may quickly solve your fly problem. Flypaper and fly tape is coated with an attractant to lure the flies in and glue to trap them when they land. It works also very well to help get rid of gnats. A very simple and effective method. You can make homemade fly paper from a brown paper bag or kraft paper and corn syrup. It is easy but takes a while since the paper needs to soak and dry. While most flies are attracted to apple cider vinegar, they cannot tolerate a component of boiled malt vinegar. Use this to your advantage by bringing a small amount of malt vinegar to a boil. Turn off the heat and allow the hot pot and vinegar to sit in the area infested with flies. The flies will leave the area. Commercial pheromone traps are effective for all types of flies, either indoors or outside. They use powerful sexual hormones to attract the fly and trap it. The only drawback with pheromone traps is that they only trap the flies of one gender. Electronic fly swatters work on the same principle as the bug zappers, except they don’t lure the bug in. Instead, you swat at the fly and deliver the electronic shock when the paddle makes contact. With an electronic fly swatter, you can swat the fly in the air, without waiting for it to land. A fly gun is a fun way to attack the problem of flies. You shoot a plastic projectile to “swat” flies. A round disc on the projectile hopefully hits the fly and kills it. I’ve never tried one of these fly guns, but they look like they might take a little practice to be able to hit the fly. A fly swatter is probably more reliable, but may not be as much fun. Another way to get rid of flies while having fun is the Bug-a-Salt rifle. You load the rifle with regular table salt and shoot at flies and other pests. The rifle shoots a concentrated pattern of salt and can be used on any insect. The salt will not harm your furniture or carpet. With a little practice, this might be a fun way to solve a frustrating problem. An old-fashioned fly swatter is an effective way to get rid of flies but takes a little patience. You stand ready with the fly swatter, waiting for the fly to land on a hard surface – hopefully not a breakable one. The minute the fly lands, you swing hard to hit the fly and crush it. Diatomaceous earth kills insects by damaging the exoskeleton. The particles are sharp and create tiny cuts which desiccate the fly and kills it. It is one of the most effective natural methods to keep flies away. Put a few tablespoons of diatomaceous earth into a squirt bottle, shake, and puff it out onto your houseplants and around other areas that attract flies. A fine dust of the diatomaceous earth is all it takes to kill flies and other insect pests. Carnivorous plants will not solve a large fly infestation, but they will kill flies. If your problem is not overwhelming, carnivorous plants may be the answer. Keep a few Venus Fly Trap or Sundew plants for slow and steady fly eradication. Many commercial cleaners and bug repellents use citrus oils and kitchen herbs to clean and repel insects naturally. The pleasant smell we enjoy is a repellent for house flies. Use a citrus oil spray in fly-infested areas and clean with citrus cleaners. You can also repel house flies by putting out a bowl of orange or lemon peels. Stir the peels or rub them occasionally to release the oils. We cover using citrus oils and citronella in our what repels mosquitoes tips in more detail. However, if you have a fruit fly infestation, avoid using citrus oils. Fruit flies are attracted to citrus. A quick spritz with hairspray creates problems for a fly, slowing them down and allowing you to swat them easily. The sticky hairspray gums up their wings and brings them down, but you need to finish off the job with a fly swatter or a rolled up magazine. Dish detergent kills flies in a couple of different ways. The soap reduces the surface tension of water and coats the mucous membranes, suffocating the fly. Borax, an ingredient in most soaps, is also an insecticide in higher concentrations. Our recipe for Dish Soap Fly Spray uses both these properties to kill flies instantly. Treat doorways and window screens with a Pyrethrin based insecticide. Pyrethrin is a natural insecticide made from chrysanthemum flowers to repel and keep gnats, flies and other insects away. Spraying the doorways discourages flies from entering the house. You can also spray flies with a pyrethrin-based insecticide to kill them instantly. Avoid using any insecticides in food preparation areas. Although pyrethrin is natural and relatively safe, it still requires caution. Follow the label instructions carefully. Commercial Insecticide fly baits are designed to attract flies and poison them with insecticidal ingredients. You will find fly baits in many forms, including traps, pellets, liquids and window decals. Keep all insecticidal products such as fly baits out of the reach of pets and children and follow all safety instructions. Flies are persistent and annoying. If your fly infestation is not responding to other fly repellent methods, consider using an insecticide fogger. Look for a pyrethrin based foggers. Pyrethrin is a natural insecticide that degrades quickly and is considered safe. Please follow all label instructions. Insect growth regulators are hormones that interfere with the molting process and prevent the insect from maturing and reproducing. While insect growth regulators will not get rid of existing flies, they interrupt the life cycle and eventually reduce the fly population. Insect growth regulators combined with an eradication program such as trapping or insecticides can be an effective way to solve the problem permanently. Many essential oils are natural insect repellents. Use these oils in an oil diffuser or spray them in areas where flies are a problem. Lemongrass oil is a strong insect repellent. Use it as an air freshener, spraying it around doors and windows. It is safe to use in the kitchen and any other area where flies congregate. Flies Hate Cayenne Pepper and will leave the area when they detect it. Mix up a spray of water and a spoonful of powdered cayenne pepper. Spray in fly-infested areas to repel flies. Caution: do not get this in your eyes or you will also be repelled! Check the wind direction before spraying outdoors. Certain essential oils work great to repel flies in the first place. Either sprayed in a diluted solution or left as room refresher, they work really well for home entrance areas. Your herb garden can serve multiple purposes – producing edible herbs for cooking while repelling flies and other insects. A small windowsill garden can keep the flies away. For more on fly repellent plants and flowers, head over to our tips on 17 amazing plants that repel mosquitoes. Flies are naturally attracted to food, food wastes, and other moist organic material. Keep all food put away when not in use and make sure flies don’t have access to food sources in your house. Diapers and other waste materials attract flies. Use a sealed container to store used diapers until disposal. Take out trash containing diapers as quickly as possible. Animal waste is another attractant for flies. Change the kitty litter frequently and take all animal waste out to a sealed garbage can. Areas under and around your refrigerator, dishwasher, washer, dryer, and other appliances can gather condensation and other materials that attract flies and provide a good breeding area. Clean these areas regularly with warm, soapy water. Damp mops, rags, and sponges can be excellent breeding areas for flies and other insects. Hang them up where they will dry quickly to prevent future problems. Window screens and screen doors are one of the easiest ways of keeping flies out of the house. Check your screens regularly for holes and tears. Patch or replace damaged screens. Open areas in vents, drains, and the attic fan can give flies and other pests access to your home. Cover these areas with screen and seal up other openings. Drains clogged with organic matter can attract flies and other insects. Clearing the clog and cleaning the drain is a good start on eliminating the problem. Follow these steps to get rid of flies in drains and keep them out. Flies are naturally repelled by the smell of vodka. A vodka-based fly spray can be used on your skin or on surfaces to keep flies away. Our Vodka Fly Spray recipe uses vodka and naturally repellent essential oils to get rid of flies. Scientists tell us that flies are particularly attracted to the light wavelengths at sunset. Open your doors just before the sun sets and allow the flies to leave the house. Then close the doors again before it gets dark. Flies and other insects are attracted to light and will naturally be attracted to well-lit areas. Use this to your advantage by turning down your lights and encouraging the flies to find a better lit space. Like most people, flies hate temperature extremes. They cannot live when the temperatures rise above 116 degrees Fahrenheit or below 44 degrees Fahrenheit. It is sometimes possible to allow your room temperatures to rise or fall within these limits, solving your fly problem. I would suggest that you try this solution when you are not home since these are not pleasant temperatures for people either. Commercial repellents containing Deet are the most effective commercial option, but many homemade essential oil repellents are just as effective. Try one of our recipes for an essential oil fly repellent to keep flies away. Spray on your clothing or directly on your skin for best results. Biting flies are attracted to darker colors, so wearing lighter colors gives you an edge. It may not keep them away completely, but at least you aren’t actively attracting them. You can now purchase insect repellent clothing designed to repel flies, mosquitoes, and other pests. The clothing is treated with long-lasting repellents that help keep pests away. You also purchase a product called Premium Insect Repellent Clothing Treatment that you can apply to your clothing for long-lasting insect repellent properties. Or simply spray your clothing with one of our fly repellents before going outdoors. Refresh the repellent every few hours for maximum effects. BTI (Bacillus thuringiensis israelensis), often sold as Mosquito Dunks, are effective in controlling black fly populations as well as mosquitoes. BTI kills the flies and mosquitoes in the larval stage before they can mature. Use BTI in small streams, ponds, and other areas of standing water. Neem oil is a natural insecticide and repellent. Despite its reputation as an insecticide, it is completely natural and safe to use on yourself and pets. In fact, neem oil is considered beneficial to the skin. It must be diluted before use, however, since the essential oil is strong and can cause skin irritation. Try our Natural Neem Oil Repellent recipe on your skin or use our Neem Oil Insecticide Spray to cover large areas. Use a hand-held vacuum or the upholstery attachment on your regular vacuum to remove whiteflies on infested plants. Vacuum the undersides of the leaves; this is where they hide. When done, place the vacuum bag in a sealed plastic bag and keep it in your freezer for at least a day to kill the insects, then dispose of the bag. Trim the plant, removing diseased foliage and any leaves that have white eggs or a sticky coating on the underside of the leaf. Seal the diseased leaves in a plastic bag or burn them. Wash or spray the plants with soapy water, paying attention to the undersides of leaves. The soap not only removes the flies but helps to suffocate them. As an alternative to soapy water, you can use our Neem Oil Insecticide Spray recipe. Whiteflies naturally avoid marigolds and nasturtiums. Plant these throughout your garden to keep whiteflies at bay. Repellant plants alone won’t solve an infestation, but it is an effective deterrent. Neem oil, a natural insecticide, is effective against whiteflies. Combined with the tips above, repeated applications of neem oil will help you get rid of whiteflies permanently. Follow all label instructions carefully. Many plants repel flies and other pests. Marigolds, chrysanthemums, geraniums, nasturtiums, tansy, and lavender are all known to repel mosquitoes and flies. Getting rid of flies for the long term requires a combination of methods. A good insecticide will kill flies that are currently bothering you, but a new crop will appear in a few days to take their place. Using all of the methods presented here will have the best results over the long term. Seal up the house and use screens, kill or trap existing flies, use insect growth regulators to prevent the development of new flies, and remove all organic matter that could attract new flies. By combining these methods, you will have the best results. You’ve probably tried many of these methods yourself, and I hope they have worked for you. To be effective over the long term, you need to combine methods that attack the fly at all stages of its life. Then keep at it. 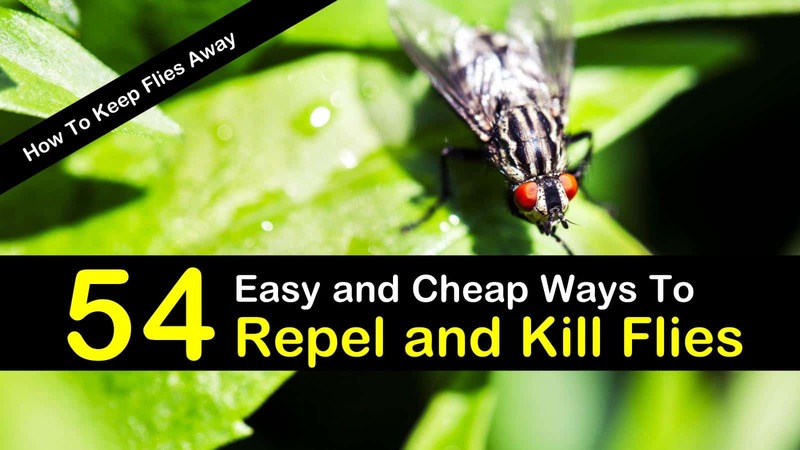 Flies will continue to arrive, but if you follow the methods I’ve listed above, you won’t attract them, and you’ll be able to get rid of them quickly. Let me know which techniques you have tried and which ones work best for you. Perhaps you know other essential oils or plants that are effective as fly repellents. Or maybe you use a method that I missed here. If so, please let me know in the comments section. I want to make this guide as complete as possible so that it will be useful in every situation. Thanks for taking the time to read through this fly repellent guide. If you found these tips on killing flies to be helpful, please share it on Facebook or pin it to Pinterest so that others can also benefit.